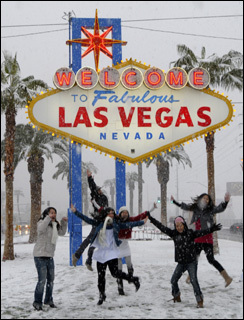 Flights resumed in and out of Las Vegas, but schools and highways were closed Thursday after a record-setting snowfall coated marquees on the Strip, weighed down palm trees and blanketed surrounding mountain areas. The city awoke to clear weather after a storm that left 3.6 inches at McCarran International Airport. It was biggest December snowfall on record there, and the worst for any month since a 7½-inch accumulation in January 1979, forecasters said. CBS News affiliate KLAS reports the winter storm dumped more than a foot of fresh snow at the Las Vegas Ski and Snowboard Resort on Mt. Charleston. The storm Wednesday and early Thursday also dumped snow or rain and snarled travel in other parts of Nevada, much of southern California and parts of northern Arizona. "It looks like Whoville, all snowy, but with less joy and more extreme misery," said Calen Weiss, 19, who was stuck Wednesday when snow in the Cajon Pass east of Los Angeles disrupted travel on Interstate 15. In Spokane, Wash., the weather service recorded 17 inches of snow in the 24 hours that ended at 4 a.m., breaking the record of 13 inches set in 1984. The city declared a "Condition Red" snow emergency, meaning crews will work 24 hours a day, seven days a week until they complete a full city plow. 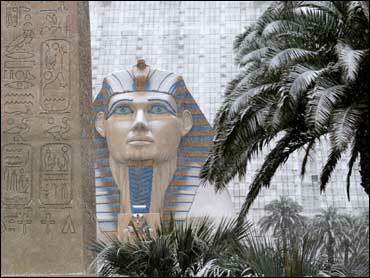 For Las Vegas, the storm left heavy wet accumulations of snow along the famed Strip. At least one carport toppled under the accumulated weight, authorities said, and motorists in Henderson parked their cars and walked home when tires spun as they tried to navigate slippery uphill climbs. Airlines resumed flights Thursday after canceling dozens of them late Wednesday, McCarran airport spokesman Jerry Pascual said. In Arizona, snow was widespread in the state's higher elevations, with 24-hour accumulations reaching 10 inches in Flagstaff by daybreak. An additional 2 to 3 inches of snow was expected. Authorities said major highways were open but advised drivers to be careful of packed snow and ice. In the western Washington state, the Seattle School District had been mocked by some for closing schools Wednesday with just a threat of snow. The threat became a reality by early Thursday, when 2 inches of snow left many commuters spinning their wheels on slippery roads. The National Weather Service said the city even had an episode of "thundersnow" when a storm cell moved across Puget Sound. Even Malibu, Calif., got a dusting of snow, as the usually balmy city saw a half-inch in the afternoon. "It's kind of cool if you think about it, said Craig Levy, director of a juvenile detention camp. "It's kind of unusual to see snow in Malibu."